Since 2002, the RAS has called GMARS home. GMARS stands for Goat Mountain Astronomical Research Station, Goat Mountain being the prominent hill to the northeast of the property. That may sound a bit intense and serious, but it's the dark-sky site where we have our ridiculously FUN monthly star parties! Over the years it has been developed into a full-fledged star party mecca, for both members and non-members alike. Below are some details about the property and the general area. 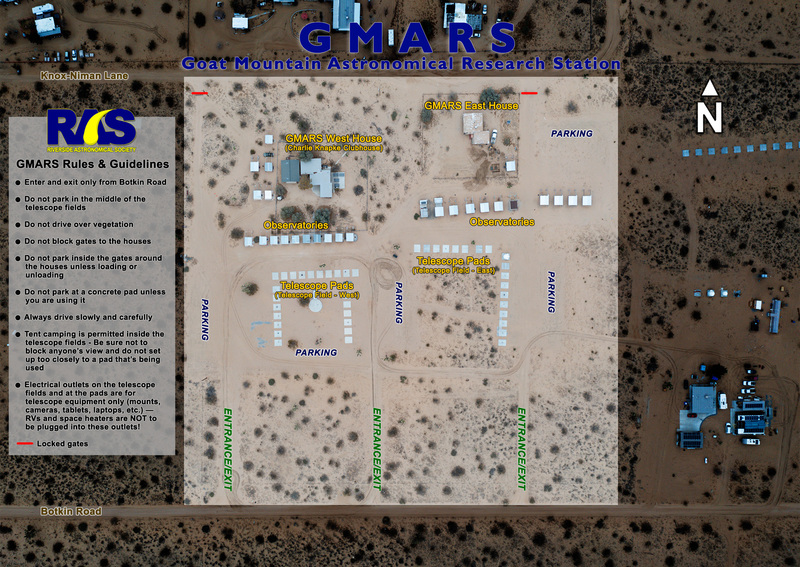 Site map of GMARS. Click the image for a larger version. 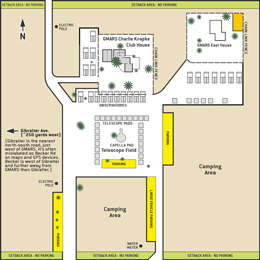 GMARS consists of two adjacent 5-acre lots for a total of 10 acres. 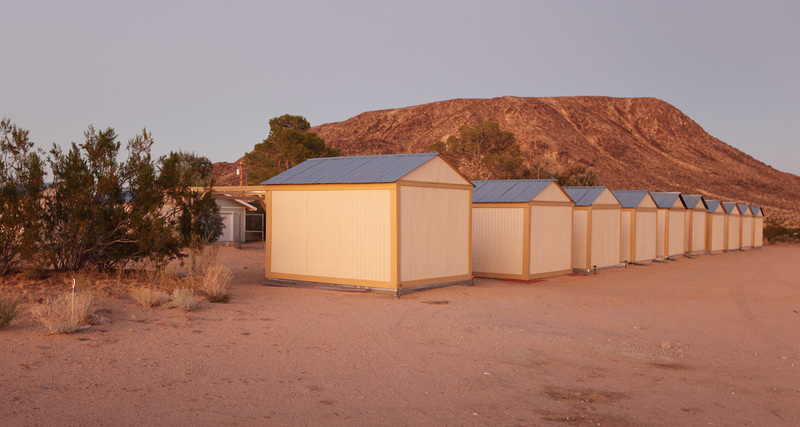 Each lot has a house with a bedroom, bathroom, plumbing, electricity—all the comforts of home. The main house on the west property (known as the GMARS Charlie Knapke Club House) has two bathrooms and a full kitchen! The bedrooms in each house have several beds available to visitors on a first-come, first-served basis. On the west property, there's also a garage that serves as the club's workshop and storage facility. It's even served as an impromptu movie theater! The grounds are typical of southern California's deserts – mostly level and soft desert sand that has been compacted in high-traffic areas such as roads and walkways. Joshua trees and sagebrush punctuate the landscape. 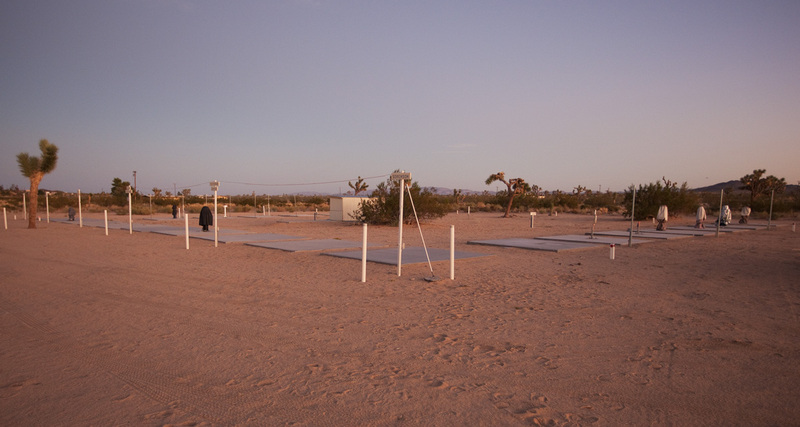 Main telescope field with concrete pads. The site is within the borders of the town of Landers, which is about 15-20 minutes north of Yucca Valley. The property is situated between Knox-Niman Lane (to the north) and Botkin Road (to the south). Street addresses are notoriously difficult in this area because Landers is unincorporated, all of the roads are dirt, and many maps (digital and otherwise) are outdated. Check the Google Map link above and also check out the Driving Directions page for step-by-step directions. There are no roads on the immediate east and west borders of the property. The first road west (about 250 yards) is Gibralter Avenue, although most maps and GPS devices have it marked as Becker Road, which is actually further west. Row of observatories at GMARS. All of the roads in the immediate vicinity consist of hard-packed sand. That said, the roads can get a little soft in areas, hard and washboarded in other areas, and they can even be partially washed out in other areas (typically around the time of the summer thunderstorms). So watch the road carefully at all times and be on the lookout for hazards! That said, the dirt roads to get to GMARS are less than 2 miles from the closest paved roads and the dirt roads are in good condition 99.999% of the time such that any passenger car can get there with ease. The nearest paved roads are Reche Road (about 1.8 miles to the south), Landers Lane (the paved portion is about 1.5 miles from GMARS), and Belfield Boulevard (about 1.25 miles west of GMARS). Landers is sparsely populated with homes, trailers, and horse ranches. Our closest neighbors are the 3 properties to the north, across Knox-Niman Lane. Most of the other inhabited surrounding homes are several hundred yards away. Some of the surrounding homes do use rather bright outdoor lighting at night. With a few exceptions, none of them are terribly intrusive. California's high desert experiences a wide range of weather—the weather at GMARS is no exception. It can reach a sweltering 115°F at the height of summer, and snow may fall in the dead of winter. Wind is somewhat common but it often subsides shortly after sundown. There are many days and nights with no wind to speak of. In the summer, it's not unheard of to have a healthy thunderstorm or two... or three. The skies above GMARS are quite nice. There is definitely some light pollution from the south (Yucca Valley and the Coachella Valley cities) and the west. 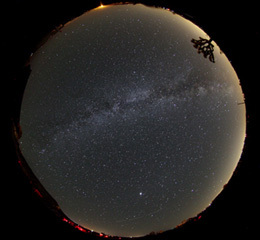 The U.S. Marine Corps maintains a training facility (MCAGCC) to the east in Twentynine Palms, and it creates a small amount of light pollution too. Don't be alarmed if you occasionally hear a low bang or rumble, see a flash of light, or witness dark and mysterious aircraft in the area—it's just the Marines. Their impact on the observing and imaging pleasure at GMARS is negligible. The skies to the north are very dark with only a barely visible glow from Las Vegas. 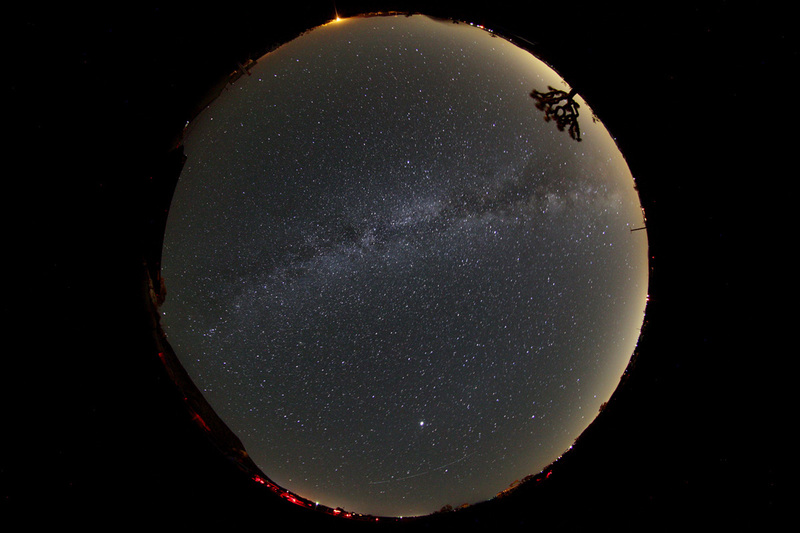 The California desert isn't known for it's steady seeing conditions, but GMARS can have some very steady nights. Seeing conditions on typical nights are in the range of 3" FWHM. Transparency can be very good on any given night.